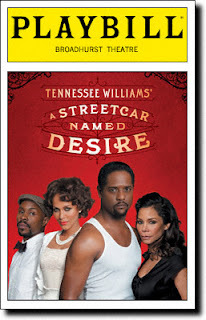 Two-time Golden Globe Award nominee Blair Underwood and Nicole Ari Parker have a volatile date with destiny in the multi-ethnic Broadway revival of Tennessee Williams' A Streetcar Named Desire, which officially opens April 22 at the Broadhurst Theatre. Emily Mann (Anna in the Tropics, Miss Witherspoon) directs the New Orleans-set drama that began previews April 3. 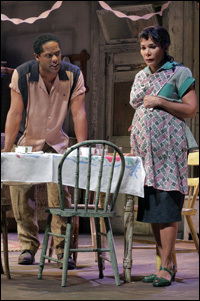 The revival is produced by Stephen C. Byrd and Alia M. Jones of Front Row Productions, who were also behind the all-African-American revival of Cat On a Hot Tin Roof on Broadway in 2008. What Is the Story of A Streetcar Named Desire? Blanche DuBois, a former schoolteacher and fading Southern belle, arrives in the French Quarter of New Orleans to stay with her pregnant sister Stella and Stella’s husband Stanley. Blanche is disdainful of the couple’s cramped quarters, though it is quickly revealed that the DuBois family home, Belle Reve, has been lost and she has nowhere else to go. Blanche's genteel sensibility and judgmental nature brings out the worst in the hot- tempered, working class Stanley. Blanche, ever hopeful, sparks a romance with Stanley's friend Mitch, until Stanley goes digging through her seamy past to destroy her hopes of a fresh start in New Orleans. When Stella goes into labor and leaves for the hospital, Stanley and Blanche are left alone in the apartment, and things come to a violent head. What Is A Streetcar Named Desire Like? New Orleans jazz legend Terence Blanchard composed the score for this production of Tennessee Williams' classic drama, and the languid inter-scene music captures the charged inertia of the story. The single set also lends to the sense of claustrophobia. Stanley and Stella's glorified one-room apartment is set cheek-by-jowl with those of their neighbors, and on hot nights everyone spills out into the miasma of humanity that is the French Quarter. Though the language is poetic and the story is a ultimately a tragedy, this production successfully mines the comedy of Streetcar's culture clash, which keeps this landmark play from bogging down in self-reverence. Is A Streetcar Named Desire Good for Kids? Given the darker elements of this story, mainly concerning Stanley's abusive treatment of Blanche, this one isn't for younger kids. But considering that this American classic is required reading for many schools, middle-schoolers and older could certainly handle the poetic language and emotional content. Just be prepared to answer their questions after the show. Visit www.Telecharge.com or phone (212) 239-6200. The Broadhurst Theatre is located at 235 West 44th Street.